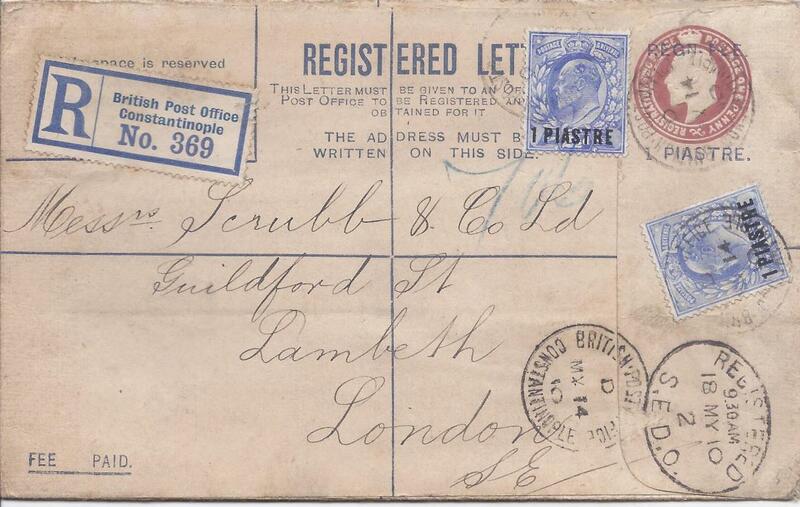 1871 (MY 26) cover to London bearing single franking GB 6d., JE, plate 9 tied by barred 'C' cancel, reverse with fine unframed British Post Office Constantinople code A cds, red arrival on front. 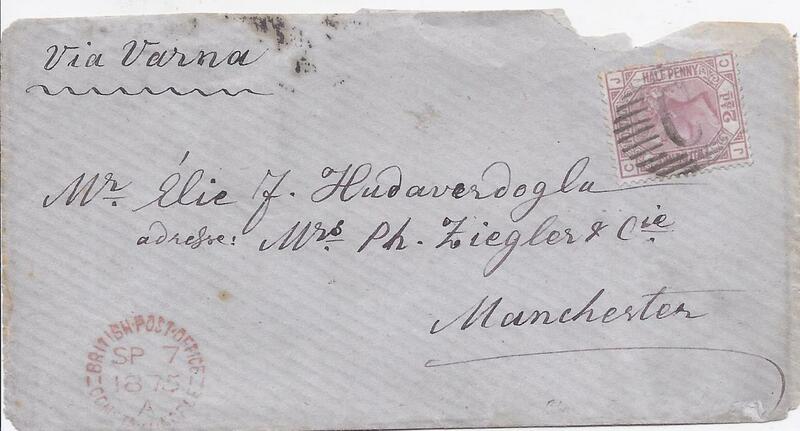 1875 (SP 7) cover to Manchester, endorsed "Via Varna" bearing Great Britain unoverprinted 2 1/2d. 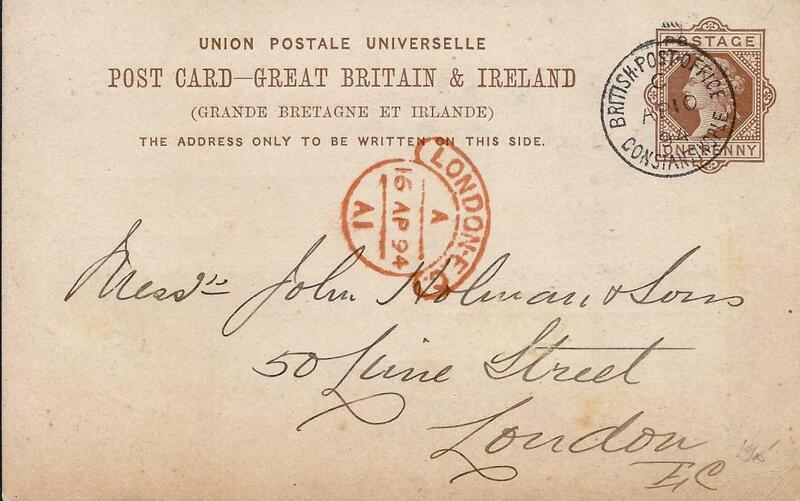 mauve on blue, JC, plate 1, tied 'C' obliterator with red British Post Office Constantinople code A cds in association,arrival backstamps; slight fault to envelope at top and opened-out for display. 1883 Great Britain unoverprinted 1d. 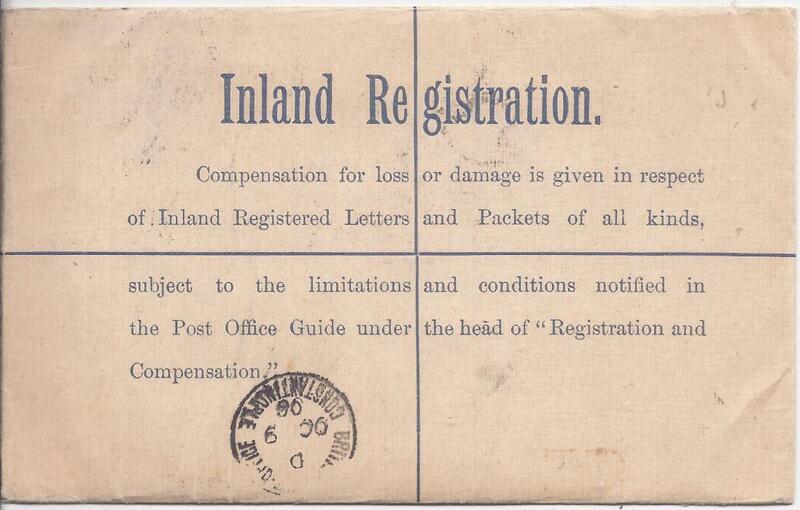 stationery card to London cancelled by fine �C� obliterator and equally fine British Post Office Constantinople cds; a fine example. 1884 (FE 2) 1d. 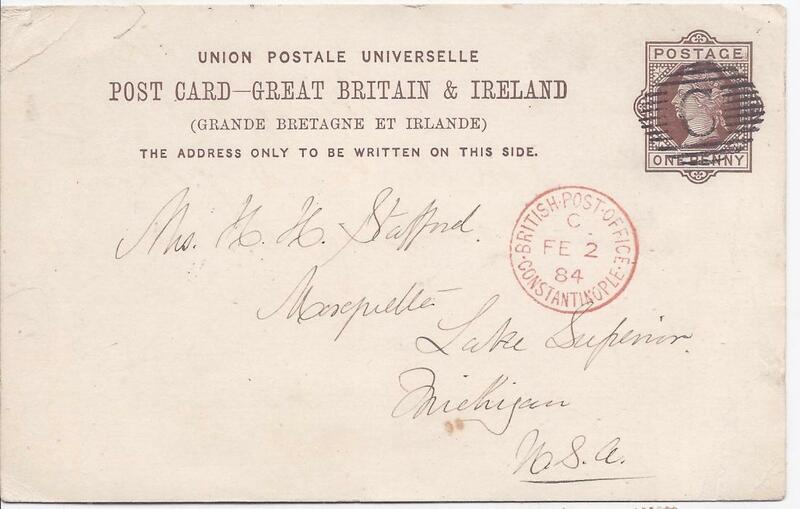 postal stationery card to Lake Superior, Michigan, USA, cancelled by barred'C' with very fine red British Post Office Constantinople code C cds; long message on reverse. 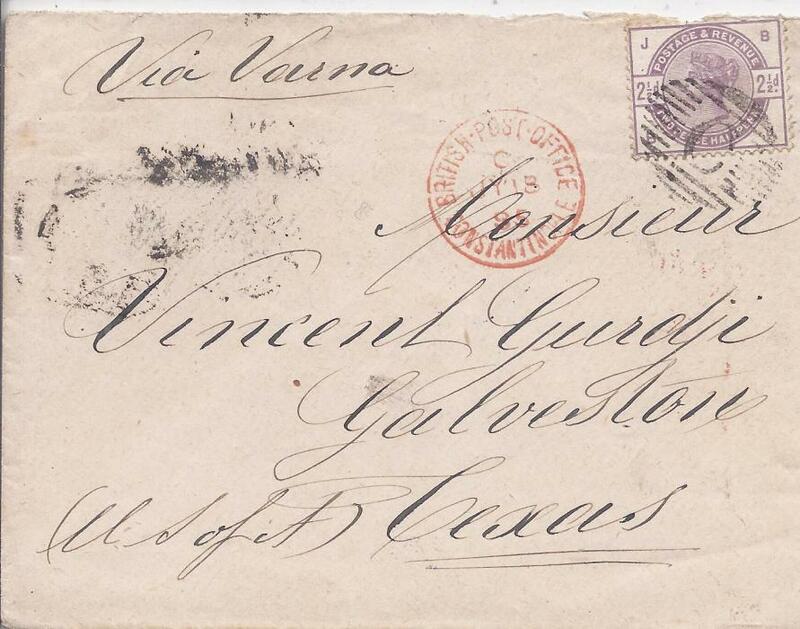 1885 (JY 18) cover to Galveston, Texas, franked by 2 1/2d. 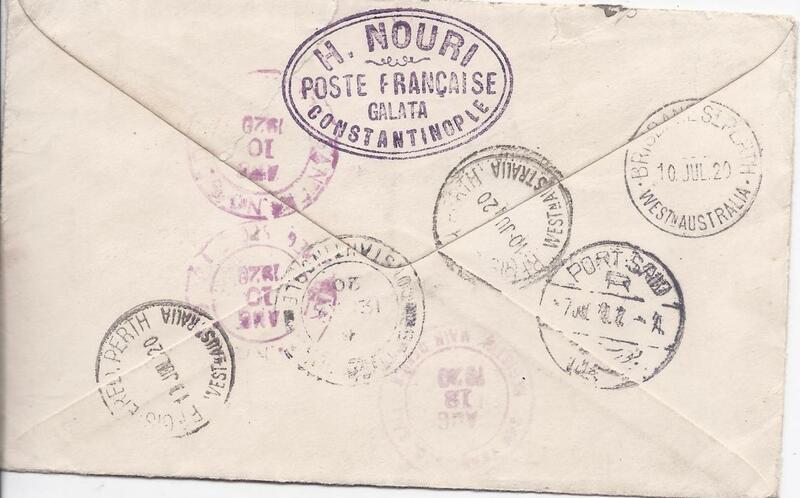 cancelled by barred 'C' with red British Post Office Constantinople code C in association, envelope endorsed "via Varna", reverse with London and New York transits and arrival cds. 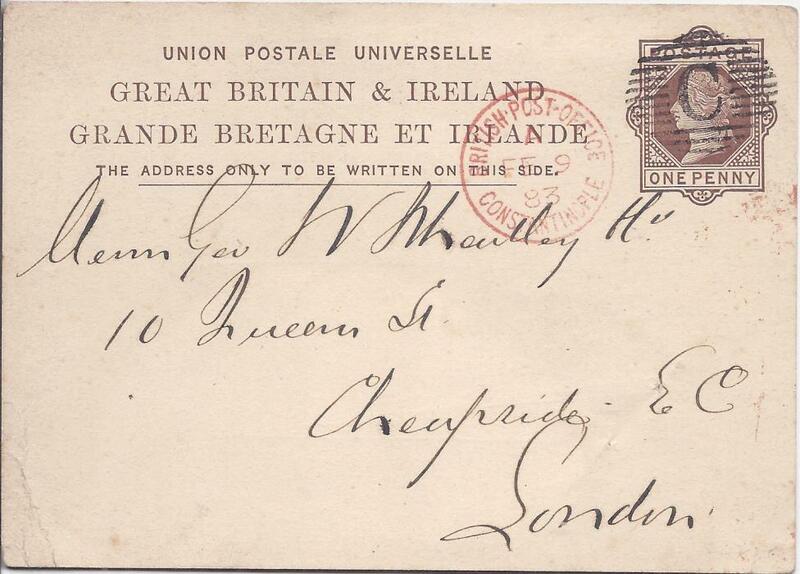 1886 cover to Wimbledon, franked vertical strip of three '40 paras' on 2 1/2d. lilac, GB-IB, tied barred oval 'C' with a black British Post Office Constantinople code A cds on reverse which is overstruck by the arrival. 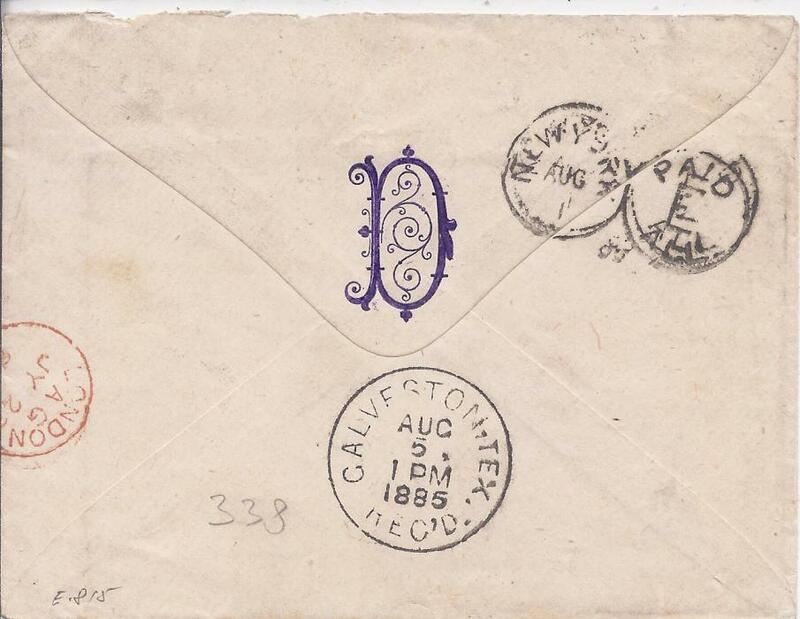 1887 (MR 22) cover to United States bearing single franking Great Britain overprinted '40 PARAS' on 2 1/2d. tied 'S' obliterator with British Post Office Constantinople code C cds in association, reverse with New York 'opera glasses' transit and Chester N.H. arrival cds. 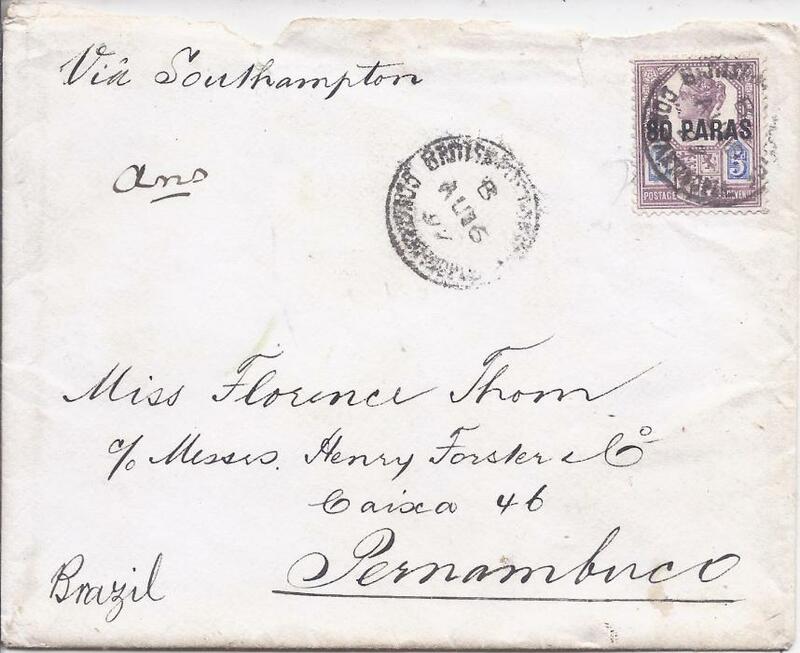 1897 cover to Pernambuco, Brazil, franked '80 paras' on 5d. 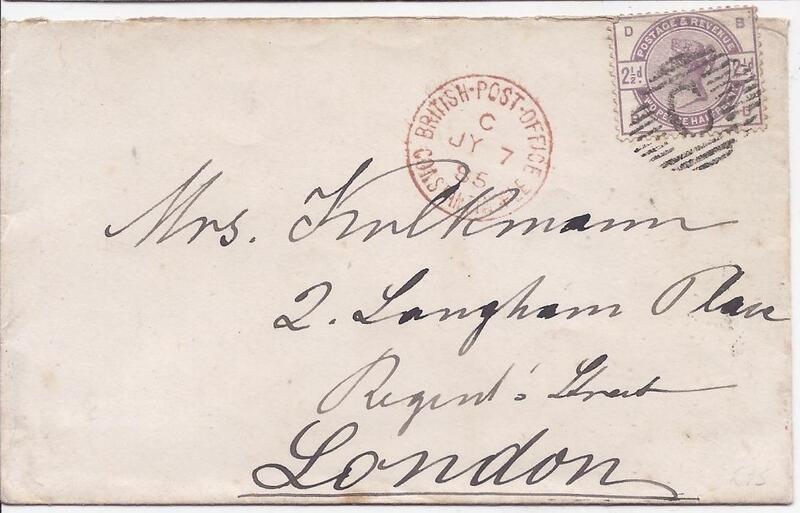 tied by British Post Office Constantinople code B cds, annotated to go via Southampton, London transit and arrival backstamps; some faults to envelope at top, a scarce destination. 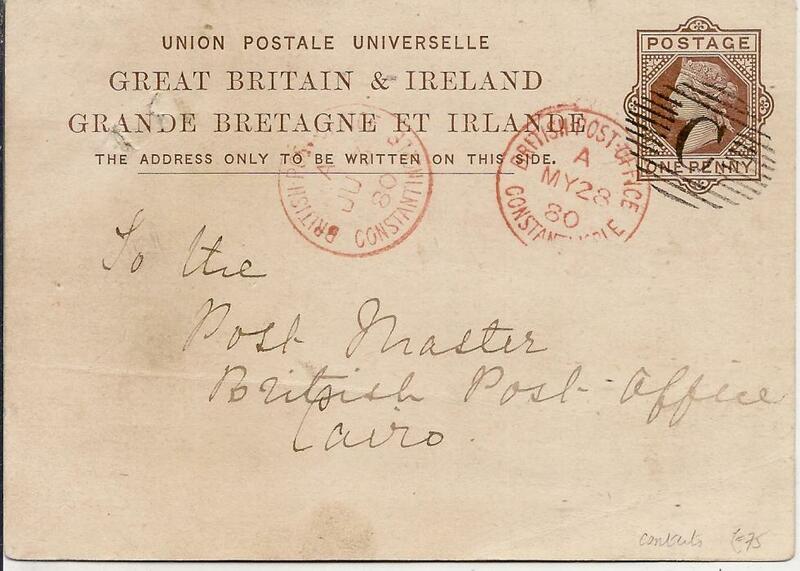 1906 '40 Paras' registered postal stationery envelope to Upsal, Sweden uprated pair 'LEVANT' overprinted 2 1/2d. 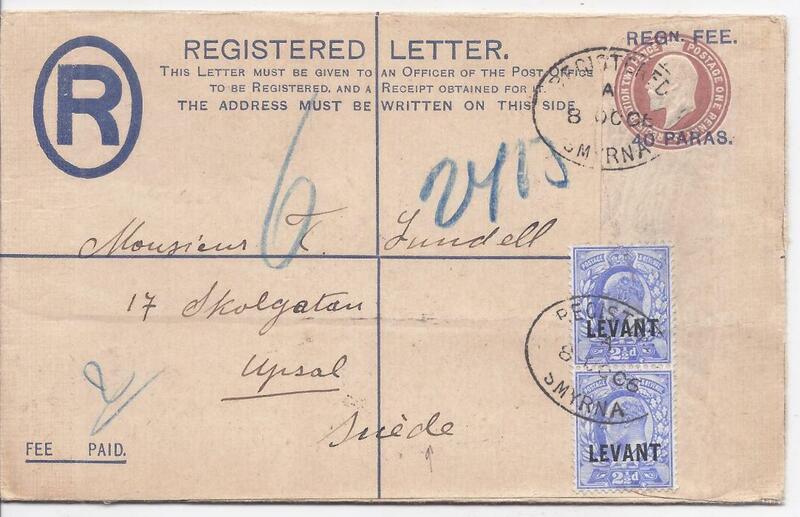 and tied oval Smyrna date stamps, Constantinople transit on reverse, without arrival; good condition. 1910 (AP18) registered printed envelope to Dresden, Germany bearing five colour KEVII franking tied British Post Office Constantinople, code C cds, arrival backstamp; some slighttoning mainly around registration label, still a colourful item. 1910 (MY 14) '1 piastre' on 1d. 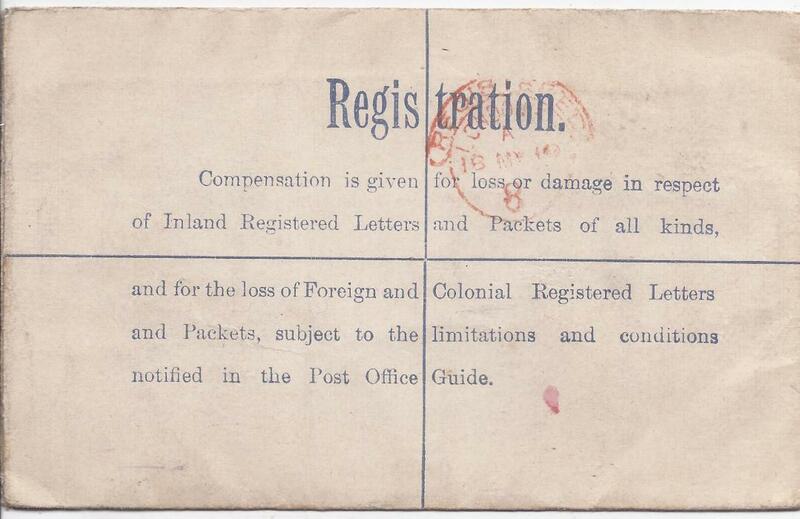 postal stationery registration envelope, uprated two KEVII 1pi tied British Post Office Constantinople code D cds, red arrival backstamp. 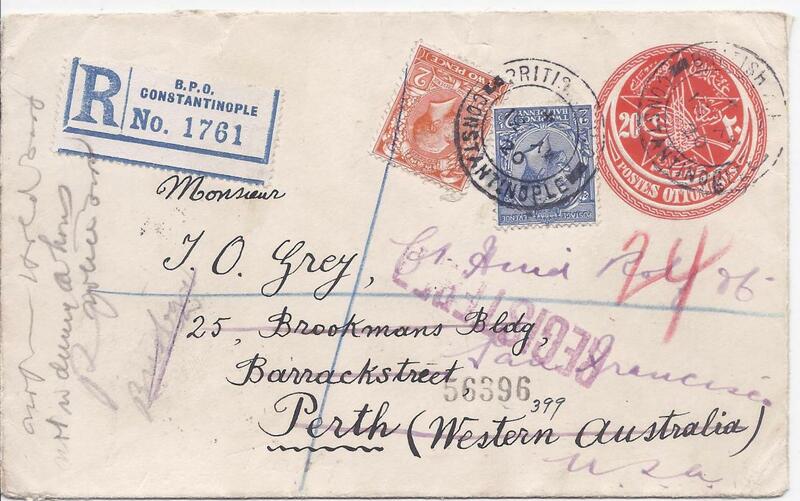 1920 registered cover, an Ottoman 20pa stationery envelope used, to Perth, Western Australia, franked unoverprinted Great Britain 2d and 2�d. 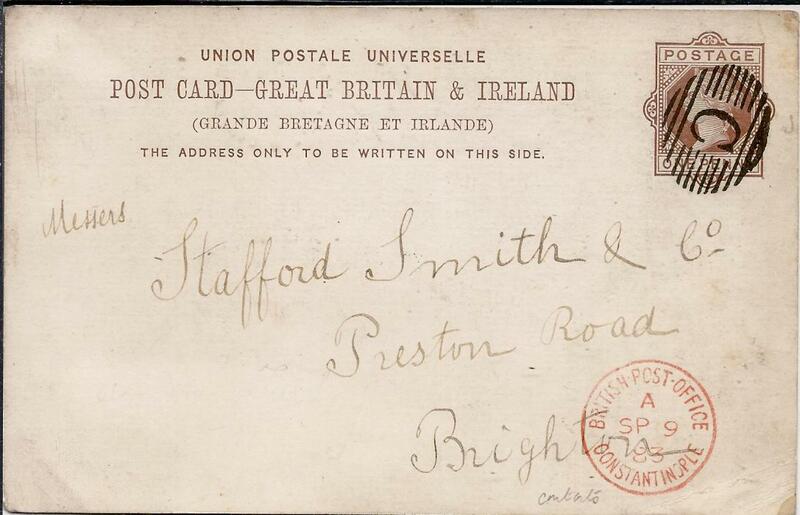 tied British P.O. 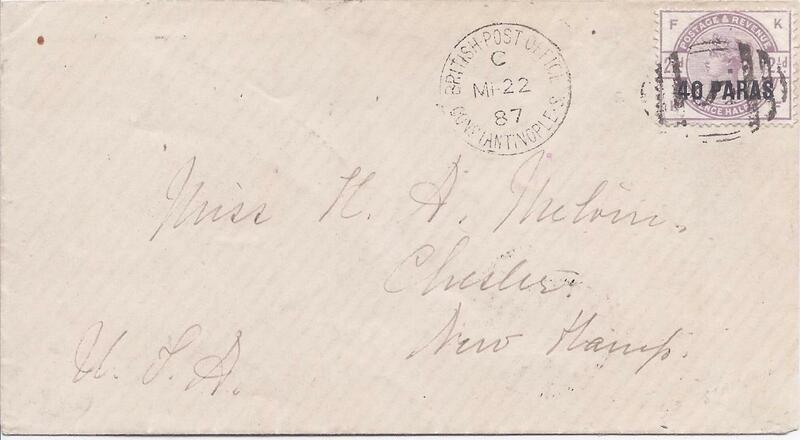 Constantinople date stamp, redirected from Perth to United States. 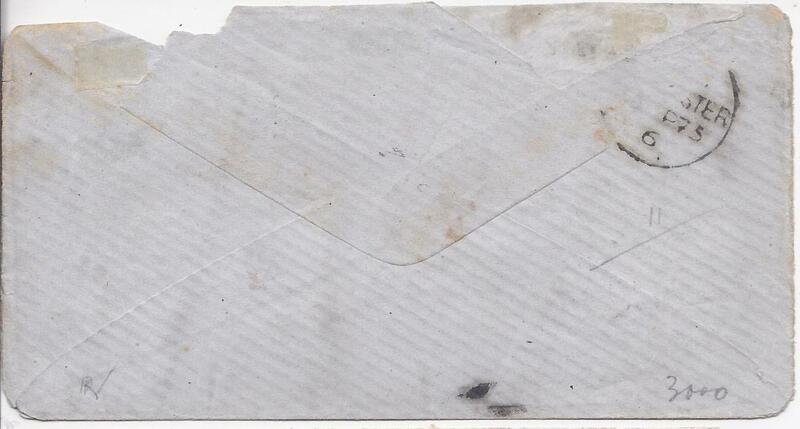 Envelope opened out for display. 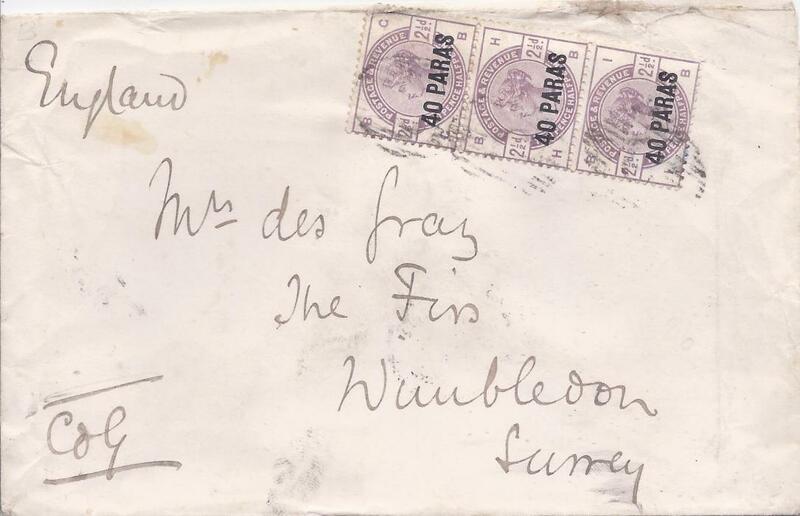 1922 registered cover to Paris,the sender using an old Queen Victoria stationery envelope '40 Paras' on 2 1/2d. with inverted surcharge, franked on reverse with 'Merson' value tied Constantinople cds; an unusual item.